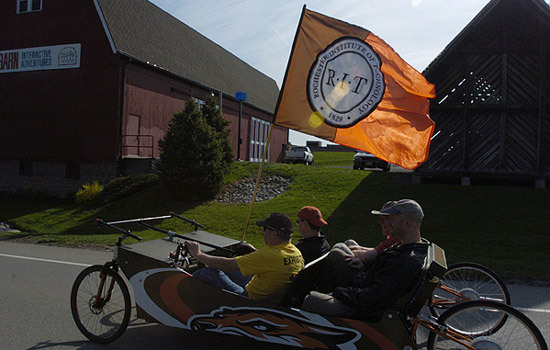 Ten vehicles, each custom-built by RIT students, faculty and staff members, competed in RIT President Bill Destler’s Green Vehicle Challenge, a competition designed to see who could create the vehicle that used the last amount of energy. The challenge kicked off the second Imagine RIT: Innovation and Creativity Festival on May 2. The vehicles of the future were in action this morning at Rochester Institute of Technology as RIT President Bill Destler’s “Green Vehicle Challenge” kicked off the second annual Imagine RIT: Innovation and Creativity Festival. The 10 challenge participants competed to see which vehicle could complete a three-mile loop around campus while expending the least amount of energy. Two teams rose above the competition, both using less than 40 watt hours of energy, but a team from RIT’s Facilities Management Services claimed the top prize—an antique banjo from Destler’s collection. The Facilities Management car, driven by staff member Scott Smith, used only 27.7 watt hours. “I really feel tremendous about representing Facilities Management Services and being part of the team that designed and created the best green vehicle on campus,” Smith says. The winning team was able to choose between the antique banjo and a cash prize of $1,000. It wasn’t a difficult decision for Smith and his colleagues. Team CIMS, from the Center for Integrated Manufacturing Studies, finished closely behind (using 35.6 watt hours) and were recognized as a co-winner by Destler during the festival’s opening ceremonies. Destler issued his challenge to the RIT community as a way to encourage students, faculty and staff members to begin thinking about ways to utilize alternative forms of energy.